Elad Blog: Should You Raise Money Before You Ship Product? Should You Raise Money Before You Ship Product? I was recently asked a question on Quora about fundraising timing. The gist of the question was, "should you really only try to raise before launch, or once you have traction, but not in between?" I.e. is it *bad* to wait to raise money until after launch if you don't have evidence that the launch will have traction? The short answer is, "yes, but it depends." Please note, this post is about how to time when you *need* to raise money, rather than when you *should* raise money. All else being equal, if you can avoid it, I would suggest against ever raising money. 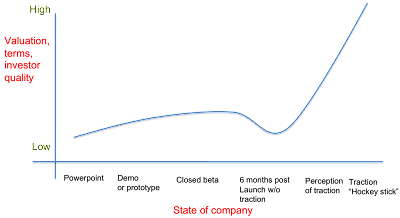 Similarly, if you can run your company very lean and keep launching products and iterating until you hit traction you should definitely do that unless there are other forces that suggest you should raise money and go big fast (e.g. Zynga doing massive raises to dominate an industry via ad buys, acquisitions, etc.). Now, a quick aside on "traction". Traction doesn't have to mean crazy daily doubling of a user base. You could be e.g. a business to business service with a solid rate of customer sign ups. If you are a very frugal startup and the small number of sign-ups gets you to ramen profitable, you don't *need* to raise money and your leverage goes way up. Larger team size. This is counter intuitive (e.g. a larger group of engineers can get a better valuation than a smaller group, even with the same product/traction, despite the negative aspect of a higher burn rate). If you don't have the bottom 7 items on the list, but have traction/solid growth you will still have way more leverage than 95% of the other early stage companies. Fundraising with traction/solid growth is obviously best. However, if you raise before launch (but with a strong demo, prototype or closed beta) you may get better terms or investors than if you fundraise many months post launch but have little or no product adoption. This can be mitigated in certain tactical ways I will discuss in another post, but in general is true. The key is to time it so that you don't run out of money a few months after a launch that lacks traction. The next best time to raise money for an early stage company is if you have a working prototype or demo that shows where your product vision is heading, that you can build stuff, and that you have good product sensibilities. This is true as you may be able to raise on better (or at least equal) terms when you are in a closed beta (where you can spin as growth constrained by you), versus a live product that has been out 3-6 months with no growth. Getting equal terms earlier means you got better terms, as you got the same money/valuation/terms in a much riskier company state. Sometime you can get even better terms then if you were fully live for many months (there are a number of companies who raised while still in close beta or shortly thereafter, e.g. Aardvark and Qwiki). 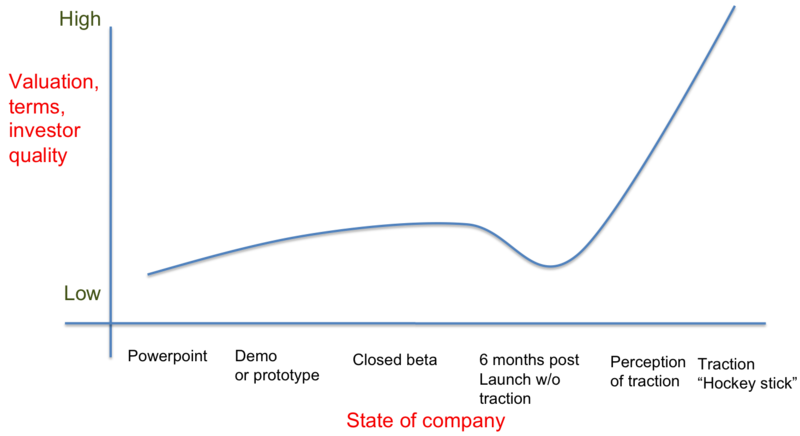 It is most likely your first product launch/iteration will result in very little adoption. Investors will look at this lack of adoption and assume the product or market are off target and not worth funding. Before launch, investors can imagine whatever they want for your product. This is called "selling the dream". Investors can apply their own vision to your product idea, and imagine a path by which the product could be huge. After launch and a few months of slow growth, the vision will be tainted by reality. They are no longer funding a dream of success, but the cold reality of "distribution is hard"
Investors want to invest in things that are obviously working. Investors want to invest in "fresh" companies. If you have launched and stuck around with nothing happening, then your company can appear "stale". This is especially true if you have been talking to investors on an ongoing basis (even if it is just as "updates"). If you are running out of runway, and have no traction, your back will be against a wall for the fundraise. Investors can smell desperation. In general, as an entrepreneur, you should try to get as far along as possible towards traction before fundraising. That said, you should be cautious of running out of runway a few months post product launch, because if the product is not successful it will be harder to raise a round. This logic is especially true for ads-dependent consumer products - i.e. having few users and a lack of real growth for a few months = a harder time for the company to raise money. In contrast, a B2B company with a few customers may be in better shape as you have revenue coming in, which decreases your burn. If you can get to ramen profitability, then you have an alternative to fundraising and more leverage, meaning better terms for you. But, most consumer companies don't have a path to ramen profitability early since their whole monetization model is based on traction/page views. In a future post, I will focus on tactics to successfully raise a series A round, even if you do not have hockey stick growth but have launched your product (which is what most companies eventually have to do). One way to do it is to claim traction, or point to indicators of traction even if you do not have crazy growth. Variants of this include being in a closed beta ("we choose not to grow"), showing how you are in just 1% of your addressable market and plan to expand to the other 99%, proof that media buying can drive growth cost effectively, or raise money in traffic upswings (e.g. Google lets you out of their SEO sandbox). More on this to come.